At the Gulfood2019, Tea Valley unveils the widest range of the finest, richest and most affluent tea blends ever in the global market. DUBAI – February 21, 2019: Tea Valley, an aggressively emerging tea brand from De Diet Chef India, debuted at GulFood 2019 marking its foray into to the Middle East market with the world's widest ever range of tea blends for the international tea lovers, aimed at catering to a growing interest and trend towards specialty tea market in the region. Tea Valley also hosts the Tea House zone at Gulfood 2019, which runs from February 17 to 21 at Dubai World Trade Centre. Eurostar Group, leading business conglomerate in the Middle East, is associate business partner of Tea Valley in the region, and the brand is currently finalising its channel partners across GCC markets. The caf� & beverage segment of Gulfood this year focuses on specialty tea, striking into this unsaturated market with tastings, masterclasses, food pairings and sommelier demonstrations exclusively at the tea house zone. Basics of Tea education session - Tea Valley expert will lead an educational session at the Gulfood about the basics of tea to create awareness about the various nuances of tea including the four basic variations – Black Tea, Green Tea, Oolong Tea (traditional semi-oxidized Chinese tea) and white tea. The experts will share their insights on the fermentation process and caffeine levels of each and summarized by intricacies of tea consumption habits and types of tea. Right Tea Mix competition - A competition for visitors on guessing and creating the right tea mix by picking teams of people from the audience and serving them different tea mixes. Jhumur Dance - A traditional dance of tea tribe communities of Assam and some parts of West Bengal, performed during Autumn season. Mime Show -Tea-customized performance interacting with the audience and disseminating happiness among them. Turkish dance performance - Themed around Mediterranean tea culture. Tea Pairing competition - The zone will feature a tea pairing competition with tea and a light snack demonstrating the special skill. Chinese Tea Master Ceremony - A Chinese Tea Master performing for 20 mins, twice by serving tea to the audience using different tools and tricks, to engage them and bring happiness to their life. Tea Theme Caricaturist - A digital caricaturist will draw audience enjoying a cup of tea in a funny manner. A video live streaming of the drawing will run on a LED screen to motivate audience. Moroccan dance performance - The shows will recreate an ethnic Moroccan experience and feel, by professional dancers serving Moroccan tea. All props such as kettle, pots and cups will recreate the Moroccan theme. In addition to this, the tea house zone features activities including Chai Masala, Tea for the Body and The Soul, Arabian Flavours, Ice-Tea Mixology and Tea Water Color Art. 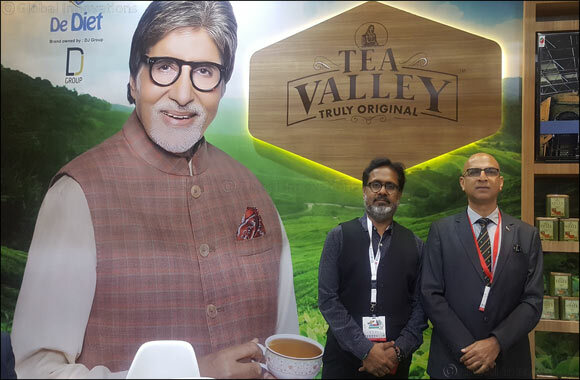 Throughout the GulFood show, Tea Valley set up a selfie zone that features an actual tea plucker with Tea Valley packs available at the booth for clicking pics. One Mega Prize winner will be chosen through a raffle draw on the final day from the participants, all of them will be given Gift hampers, Giveaways and Prizes of TEA VALLEY on a daily basis.